Tennessee remains popular among RVers due to its central location between the Midwest and South, rolling wilderness areas, and majestic sights and sounds. Between some of the country’s most colorful National Parks, the Country Music Hall of Fame and Museum, and over 1500 Civil War sites to visit, Tennessee brings together a little bit of traditional America. So where do you go when you head to Tennessee? Here are top five RV grounds, parks, and sites so you can explore all that the Volunteer State offers travelers. Deer Run RV Park bills itself as “where camping is a pleasure,” and we find that claim hard to refute. Full utility hookups greet you at this lovely forested setting as well as cable TV at your site. Showers, restrooms, and laundry facilities are all well maintained and clean. You can get firewood delivered to your site, rent a golf cart to explore the area, grab some supplies and food at the camp store and deli or relax at the park’s beach areas. Even do some great fishing onsite at the private lake. They also have cabins. Crossville is full of natural charm and beauty. Fall Creek Falls State Park and the Catoosa Wildlife Management Area are only a few miles down the road for some outdoors fun. Crossville is named for being a crossroads between eastern and central Tennessee. Pick this RV park if you want to explore all the major Tennessee attractions like Nashville, Knoxville, or the Great Smoky Mountain resort towns like Gatlinburg or Pigeon Forge. Lakeview RV Park was voted Tennessee Campground of the Year by the Tennessee Association Campground Association in 2010-2011 and 2013-2014, and that’s coming from a state loaded with great campgrounds. Paved roads welcome you to extra wide sites outfitted with full utility hookups and cable TV overlooking Boone Lake. You can expect clean and bright and private bathrooms, showers and laundry facilities. The campground store has complimentary coffee every day along with a business center, and Lakeview rounds out their facilities with group pavilions, boat and golf cart rentals. You can hit Boone Lake right from your campground for on the water fun including fishing, skiing, tubing and more. Lakeview is close to all the famous attractions of Johnson City, Bristol and Bluff City such as Bristol Caverns, the Appalachian Wilderness, Roan Mountain State Park, and Bays Mountain State Park. Lakeview is also excellent for race weekends as it is only three miles away from Bristol Motor Speedway. This Army Corp of Engineers campground provides outdoor fun or the soul and music of Nashville. You have excellent amenities and facilities at Seven Points Campground, such as RV sites with electric and water hookups with dump stations located throughout the park. Bathrooms, restrooms, and even laundry facilities are located throughout the park to clean up after a fun day out. A large playground is ready for the kids as well. Seven Points Campground is located right on Percy Priest Lake and has a dock so that you can hit the lake directly from your campsite. Don’t worry if you don’t have a boat; you can still play in the water on the campsite’s beach. 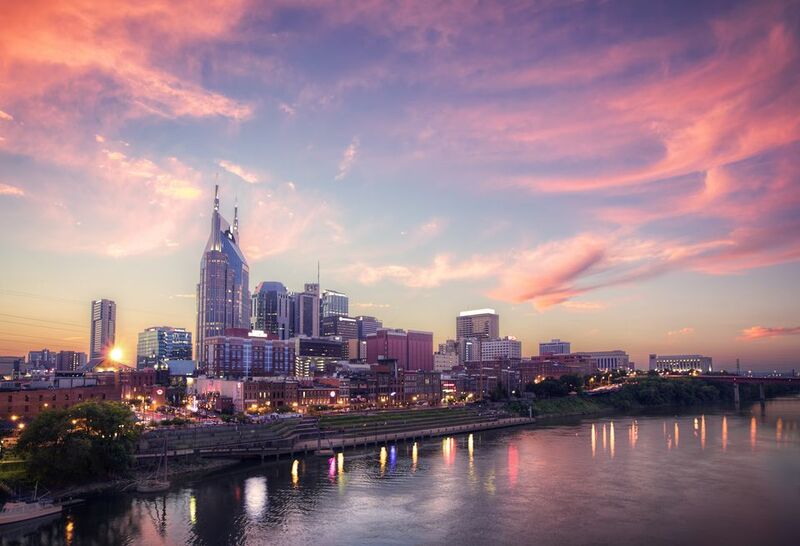 You’re also close to the fun of Nashville, the country music capital of the world. Catch some live music, eat some delicious BBQ or enjoy whatever brings you to the Nashville area. Scenic views, rolling hills of dense forest and plenty of amenities and facilities welcome you at Pine Mountain RV Park. Pine Mountain RV Park sites come equipped with full utility hookups, picnic table, fire ring and cable TV all on a concrete pad. All the bathrooms, showers and laundry facilities are bright, new and clean. Grab a bite to eat at the snack bar, or gather supplies at the camp store. You are only two blocks away from the lovely Pigeon Forge Parkway for charming shops, dining, and other attractions. Outdoors types are only a few minutes away from Great Smoky Mountain National Park or the hikes and zip lines of the Pigeon Forge wilderness. Pigeon Forge is also home to Dollywood, a great amusement park for the whole family. The gigantic Titanic museum is in Pigeon Forge as well. A perfect rating of 10s across the board from Good Sam RV Club and tons of area attractions make Smoky Bear Campground a great RV park. Sites are shaded, roomy and come with full utility hookups for all your creature comforts; sites also include picnic tables, fire rings, and Wi-Fi access. All dirty after a day on the trail? No worries as Smoky Bear has plenty of hot showers and laundry facilities. The clubhouse has a full kitchen available for public use, an RV and camp store for supplies as well as group pavilions. Gatlinburg is a great city for the outdoorsy types. America’s most visited National Park, Great Smoky Mountain National Park is right around the corner along with charming Gatlinburg itself, full of unique attractions. Take a drive down to see the splendid Tennessee Aquarium in Chattanooga or relax in Smoky Bear’s hot tubs after a long day. Tennessee is known for three things: Music, nature, and history. The Volunteer State is filled with adventure for solo travelers, families, or anyone looking to get a taste of everything the south has to offer. Consider RVing to one of the above five RV parks and get a taste of what Tennessee offers travelers year-round.